Cliff Le Couteur was my father. My name is William Le Couteur, and I have two brothers, Allan and Peter.I have decided to write what I know of his life mainly to provide a record for interested parties, as well as for my brother Peter's sons Allan and Tim, and my other brother Allan's children, Mark and Kim, as well as my daughter Fleur. With this story goes many black and white photos, which I hope to post on this blog, or on the online photo storage Flickr. 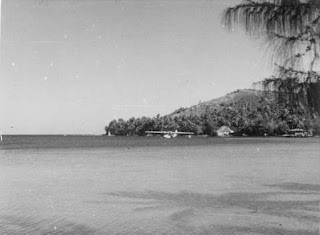 The above photo is one I found in his collection and I believe it would be the Catalina used on the Pacific Island Survey he went on in 1951. The one below is I'm pretty sure him on the wing of the Catalina. He was born in Dunedin, on 1st of October 1913, and died in 1993. His wartime nickname was Kiwi, which he kept. I remember him telling me that he was brought up near the beach called St Kilda, near Dunedin, and that he said that he still went swimming even though the sand was frozen. The family home was 24 Larkworthy St.He left primary school about the age of 12 and started work in a foundry in Dunedin. This was not to his liking and he applied and was accepted to be an apprentice carpenter. I believe he served out his time, but the depression then struck the world around 1929, which would make him about 16 years old. Unable to find work, he headed across the countryside of Otago, working at various farms for board and food. At some stage in this, he met my mother, Doris Kempthourne, who lived near the small town of Heriot. He must have heard that things were better in South Africa, because he took a trip there in 1936, and was not only able to work there, but learn to fly there. This money must have been enough for him to return to New Zealand and marry Doris in 1937, and once they were married, he took her to South Africa. They then returned to New Zealand in 1939 and had my two elder brothers, Allan and Peter. Around 1940, he was called up to fly in the RAF. 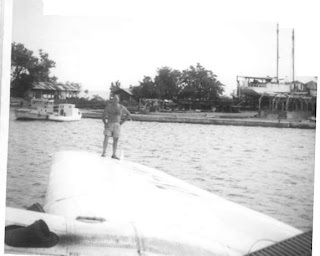 He trained to fly bombers, but during training, he broke an arm playing rugby, so he ended up training on flying boats. During the war he flew the Sunderland and also the PBY Catalina. He must have done quite a bit of flying in the Mediterannean, because I remember him talking of flying out of Gibraltar and Malta. I remember asking him if he ever had to fight against another aeroplane, and he told me of the time he was attacked by a JU88? (a German transport aeroplane). He said they escaped by using the slow speed of the Catalina and showed me scars in his neck where bits of something hit him. Apart from this story, I have no idea why he would have been accorded a DFC. Apparently I can contact the RNZAF to find out, but cannot seem to bring myself to do so. At the end of the European war he returned home to New Zealand, and was expecting to go and fight against the Japanese, but he was not needed because of the atomic bombs that ended that war. After the war, he started work with Tasman Empire Airways Ltd, (TEAL) which was providing the first passenger air services to and from New Zealand, Australia and the Pacific Islands. At this time, 1946, I was born. I understand that it was pretty special to have survived the war, and I have an idea that I might have been spoiled a little. He was given a "State" house at 34 Stewart Rd in Mt Albert. Many of his neighbours were returned servicemen, and I was told later that they had a neighbourhood tomato fight - grown men standing on the tops of the little potting sheds in the back garden flinging tomatoes at one another.I guess it would be as good a cure for the terrors of war as anything. "Now, if you need a rest, all you have to do is back up to the house and lean it." Which he proceeded to do. The women next door who was watching all this just about had a nasty accident laughing so much, because he chose to rest against a window, which he broke. I remember that he used to take me to the Parnell Baths for me to learn to swim. He owned a 1928 Dodge, which he called Esmeralda. He was very pleased with this car, but the split rims caused him some anguish! It was a romantic time for the flying boats, and it would have been fantastic to be on one of those flights. There was a special expedition mounted in a Catalina, and he was one of the pilots. This expedition's purpose was to survey and clear landing spots in the coral reefs. I think he enjoyed this immensely, and told me stories of taking dynamite down in the water to blow up bits of coral reef. I have his diary of the trip, and one of my tasks is to translate his writing and show it on this blog. Around 1952, he bought a section of land at 28 Glen Atkinson St and proceeded to build a house there in his spare time. I realise now that this was an undertaking he should not have attempted, though he did gain much satisfaction from the various stages of completion. For my part, I thought we would never get above the mud and concrete of the foundations. He finished building the house around 1962 (enough for us to live in). At around the mid fifties, TEAL brought into service the DC6, a land plane with four piston engines. On my 12th birthday I remember him saying: "Do you want to fly with me to Fiji for the weekend?" These were more relaxed days, and I was able to sit in the seat in the flight deck normally have been occupied by the radio operator, which they did not have. He had the extra responsibility of being the Safety Officer. I have a feeling he enjoyed getting crews to use life rafts in the Parnell Baths. I may post this message on your other blog incase you don't get this message.